Sam Bittner nailed a 3-pointer to give Fresno State a 67-64 lead with 8:22 left to play. 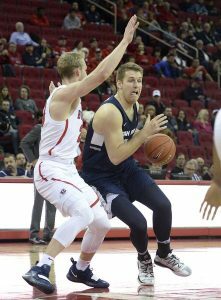 Abel Porter pulled the Aggies (18-5, 8-2 MWC) even with a 3-pointer, added 1 of 2 free throws, Queta followed with a dunk and Brock Miller hit from deep 3 to cap a 9-0 run that gave Utah State the lead for good. Noah Blackwell’s 3-pointer cut the Bulldogs’ deficit to 80-78 with three seconds left, but Merrill sank two free throws to make it a two-possession game before Deshon Taylor hit a 3 at the buzzer.